Besides the kitchen a living room or family room is the most frequently utilized room in the home. Consequently, deciding to build a living room addition is an excellent investment both from a utilization perspective and a financial one. When coming up with your living room design there are a number of excellent living room ideas that you should consider. When it comes to living rooms, bigger is usually better. As you develop your living room design, make sure to size it large enough for all of your family’s needs. Consider the amount of furniture you plan to have in it as well as the expected foot paths. Ideally you will want a living room design such that there is also some open space. A vaulted ceiling is another great living room idea for creating the feeling of a large room. The use of skylights also helps to create that large, open air feeling while also providing natural light. An alternative to vaulted ceilings is to have high flat ceilings. The inclusion of a tray ceiling in your living room design is also a neat way to create some texture and grandness to the room. When integrating the living room design into your existing home, the use of half-walls and or open window spaces between the main part of the home and the living room is also a neat idea. This again makes the living room or family room a more open space, and allows for a better connection between it and the kitchen area, for example. For finishing touches with your living room plans you may want to consider the use of columns and archways. These types of features can add a sense of elegance to the living room as well as utility in terms of creating more of an open and spacious living room. The use of French doors is another great living room idea for accent purposes and partitioning off the living room from the rest of the home. French doors can provide sound privacy while also allowing natural light to flow between the living room and the rest of the home. French doors are also a great alternative to glass sliders if the living room is expected to provide ingress and egress to the home. With home theater and stereo system technology ubiquitous in all homes today, it is important to consider the location of this equipment when developing your living room design. Make sure you identify all the outlet connections needed and the location of them in your plans. Also consider where the flat panel TV will reside. Do you plan on mounting it on a wall or have it sit on a pedestal. In either case, make sure you have the appropriate wall space to locate it. You may want to, for example, allow sufficient blank wall space in your living room design to allow for a built-in cabinet to be installed. Having built-in cabinets is a great living room idea as it can bring both functionality and charm to the living room. It is important to have sufficient lighting in a living room or family room. You may want to consider the use of wall sconces and track lighting. If you anticipate hanging a painting in the room, you may also want to consider ceiling spot lighting. Due to home theater technology frequenting the modern living room today, you may also want to consider the use of dimmer switches to control the lights. Also, in regards to home theater systems, you may want to make sure there are in-ceiling and in-wall speaker hook-up for the home theater speakers. 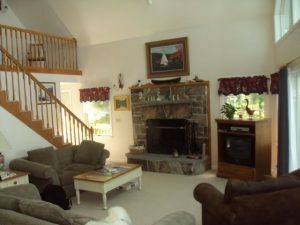 With these simple living room ideas you can maximize the beauty and functionality of your future living room addition. In addition, these small features can make the most of your investment in your room addition plans. Relatively small feature enhancements such as the use of French doors and vaulted ceilings can really improve that wow-factor to future homebuyers.